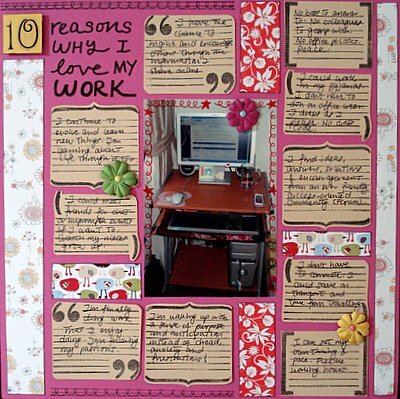 “10 Reasons Why I Love My Work” is a scrapbooking idea to stimulate you to think about the positive aspects of your work. So often, people tend to focus on the negative aspects of their work/job and they forget about the merits of their work. Don’t let that be you. Why not spend some minutes now to run through why you love your work? It might suddenly refresh your mind of your early days of enthusiasm you brought to your work. These reasons might pump up your zest once again. I’m finally doing work I enjoy doing. I’m following my passions. I set my own timing and pace. Flexible working hours. No boss to answer to. No colleagues to gossip with. No office politics. Peace. Your work makes up a pretty big slice of your life. So scrapbook about it. List down the reasons that make you feel like it’s worth your while, time, energy and commitment! Enjoy! Supplies used: Cardstocks – Bazzill Basics; White patterned paper – SEI “Chick-a-dee – gaga”; Red patterned paper – SEI “Black Orchid – Dorada Vista”; Birdie patterned paper – Pebbles Inc “So Tweet Collection – Birdies”; Journaling stamps – Autumn Leaves “Journaling by Katie Pertiet”; Black ink pad – Versa Color; Black pen – Zig Memory System “Millennium”; Flowers – Prima Marketing; Brads – KCK Craft; Number stickers – Provo Craft “Large Red Hat Letter Stickers”; Red pen – Zig Photo Signature.